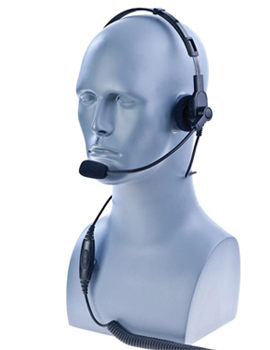 Lightweight Headset with In-Line PTT button, swivel boom microphone and adjustable metal headband. It wears over the head with the padded speaker mounting over the ear and one wire crossing the top of the head placing pressure on the opposite side. The padded ear piece and adjustable head band allows multiple users to find the best fit. This lightweight headset offers all the privacy and ease of use features of the behind the head headset but in a design commonly used in the movie industry, thus our Production Style identifier.